A great skillet set for your kitchen! This Farberware Classic Stainless Steel Skillet Twin Pack is a cookware set containing two sizes of skillets, 8 inch and 10 inch, that will fry up your favorite recipes for one to four people. 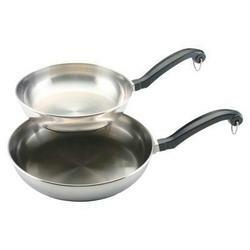 Stainless steel Provides a very durable and long-wearing pan. Aluminum core sandwich base Allows even and quicker heat distribution. Sloped pan sides Permit easy removal of food if pouring. Two sizes Are suitable for omelets, quesadillas, sauteing vegetables and meats. Versatility Permits use of a dishwasher for cleaning and oven cooking up to 350 F.